Welcome to a Thursday edition of the Backlist Bash featuring Selah Janel. 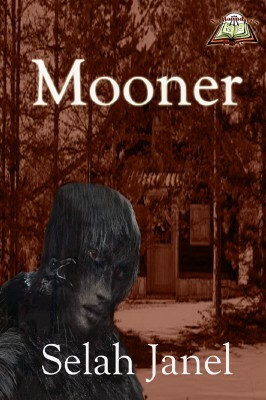 She’s with me today to tell you about Mooner, an interesting piece of speculative goodness involving vampires. Oh, and lumberjacks. SHR: What makes this particular book your favorite? SJ: I love horror, for one. I love that creepy, creature in the woods-style story, so this was a lot of fun for me to write. I also really love American history, especially the eras that tend to get overlooked. I love pioneer history, so delving into the lumberjack way of life was really interesting. There was a lot to work with. I knew I was on the right track when I discovered that they actually had a word in their lingo for a weird, legendary creature that lived in the woods; that’s where the title Mooner comes from. Lumberjacks lived such a hard life, and their vocabulary was so rough and musical, that I just found a lot to work with. It was a vibrant playground for a writer, especially when I added in the vampire character. I also really like the idea of exploring relationships. In this case, everyone seems to have an idea of what’s best for Bill, but even those with good intentions have dark and sundry methods. I love exploring motivation and emotion like that. SHR: Who published it? When?SJ: No Boundaries Press published it in January, 2012. SHR: Tell us a little about what you went through to get it published. SJ: I had originally submitted it to a handful of alternate history places, who weren’t too keen on something this gory or dark. I really liked the piece, so I figured other people would, but it wasn’t until a friend put me on the trail of No Boundaries that I really believed that other people were interested. SHR: On writing in general: What’s the hardest part for you? Why? SJ: The pacing. It takes me a while to figure out how long a piece should be, or what exactly to show and what to tell. It’s why I prefer to have a loose plot but I don’t latch on until I have a really defined character. That character helps me get an “in” to the plot, a little window where I can more easily see how things should work. Then it’s just getting the words out and editing. And re-editing. And editing some more. SHR: Unrelated: What’s your favorite color? SJ: Purple. And green. And blue. And black. And sometimes silver. Sepia on occasion. And be sure to check out NO BOUNDARIES PRESS!